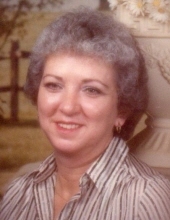 JoAnn Edwards, age 82, passed away at her Mustang home on March 30, 2019. She was born in Lebanon, TN on March 10, 1937 to Jake and Irene (Maynard) Hughes. JoAnn married Carl Thomas Edwards in 1975. She worked as a waitress and later as manager for Der Dutchman restaurants for 15 years. She enjoyed traveling, fishing, and spending time with her grandchildren. She is survived by her husband Carl, son Bobby and wife Teresa Jones, daughter Trenda and her husband Gary Caskey, numerous grandchildren and great grandchildren. Funeral services will be Thursday, April 4, 2019 at Lighthouse Baptist Church of Mustang under the direction of McNeil’s Funeral Service, Mustang, Oklahoma. Interment will follow in Red Hill Cemetery. To send flowers or a remembrance gift to the family of JoAnn Edwards, please visit our Tribute Store. "Email Address" would like to share the life celebration of JoAnn Edwards. Click on the "link" to go to share a favorite memory or leave a condolence message for the family.